Home » Posts tagged "Charlie Baker"
A review finds Massachusetts Gov. Charlie Baker’s economic development council doesn’t reflect the state’s race or gender at all. But Baker’s 59-member council is more than 85 percent white and more than 80 percent male, according to a Globe review. The lopsided demographics have prompted criticism from those who say that Baker’s personnel decisions have not lived up to his inclusive message on the campaign trail last year. But critics such as US Representative Katherine Clark, a Melrose Democrat, said that more than 70 percent of the people entering the workforce are women or people of color, according to research by the Bentley University Center for Women and Business. 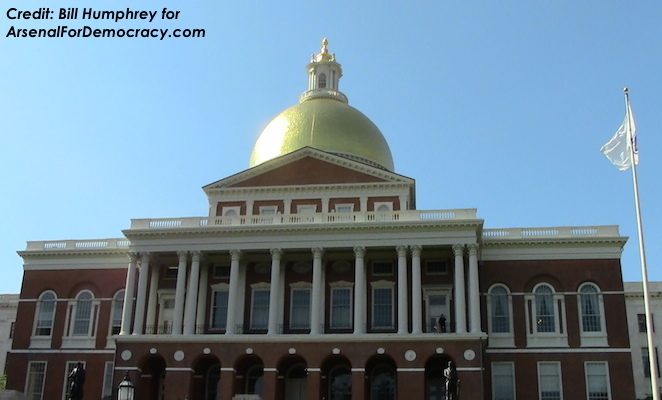 Last week the State Senate voted to restore much of the education funding to the Massachusetts State budget, including: $5.25 million to the University of Massachusetts, $217,000 for Quinsiggamond Community College, and, perhaps most importantly, $17.6 million in kindergarten grants. The House followed along the same lines. By July 30, lawmakers had restored 60% of Governor Baker’s $162 million budget cuts (via line-item veto) to the $38.1 billion Massachusetts budget originally sent to his desk. As to be expected in Massachusetts, a state consistently ranked as having one of the country’s best public education systems, it was the cuts to education that drew the most attention and ire. However, as a candidate, he refused to pledge to shrink the waiting list of 17,000 low-income students hoping to get a spot in a subsidized pre-kindergarten program. As governor, Baker has frequently pointed to the cost of pre-Kindergarten programs, but vetoed a program to establish best practices for cost-control in pre-K programs. Baker also frequently sites a Brookings Institute study, which notes the disappearance of benefits of a pre-K program by the third grade if students are in under-preforming schools. This seems like a thin defense for cutting pre-K programs, but an important reason to figure out how to improve pre-K programs. Governor Baker points out that the $17.6 million of kindergarten grants he planned to cut was part of a program originally intended to help school districts establish full-day kindergartens and with 90% of MA towns now providing full-day kindergarten, the grants no longer fulfill their original purpose. Many school leaders say their kindergarten programs rely on this funding and if it is to disappear, it should do so gradually, not all at once, leaving school districts in the lurch. The cut of these kindergarten grants was overridden unanimously in both the House by a vote of 155-0 and the Senate by a vote of 38-0. The truth is that Baker governs a state where 73% of residents support early childhood education and 53% would support raising taxes to support it. With polls like this one, it is easy to see that Baker’s values may not match up with the state he is governing. It is hard to believe that short-sighted budget cuts like this one will not come back to haunt him. He’s just proposed $40 million in cuts to state transportation (not to mention his legacy role in under-funding transportation since the 1990s) but also has the audacity to complain about the functionality of the state’s transportation …. It’s amazing how refusing to properly fund government services keeps them from performing effectively. 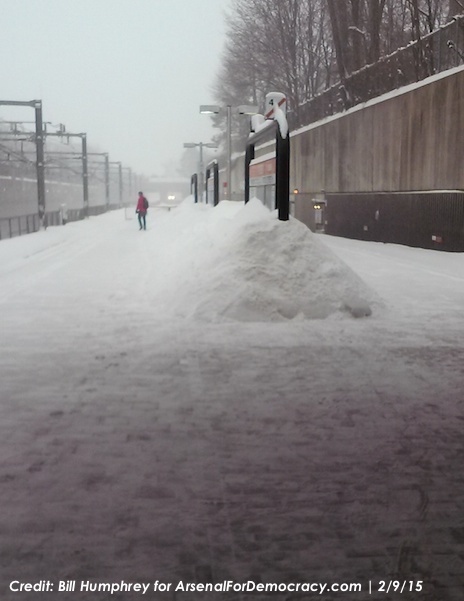 Pictured: MBTA Orange Line platform at Green station, early afternoon on Monday February 9, 2015. Baker’s new-found notoriety in the Garden State came to a head when the New Jersey State Investment Council agreed to seek a legal review of the $10,000 donation he made to the New Jersey GOP in May 2011 — just seven months before General Catalyst, the investment firm where he is listed as an “executive in residence” principal, received $15 million from the state’s pension fund. The council’s decision sparked a series of headlines across the state that has put Baker in the middle of the ongoing media feeding frenzy that is swirling around Christie and his administration. Just last week, a Washington-based campaign finance watchdog group, Citizens for Responsibility and Ethics in Washington, called on the Securities and Exchange Commission, the New Jersey attorney general, and the state’s Election Law Enforcement Commission to investigate a possible connection between the donation and the investment. Here’s a sampling of some of the headlines over the past month: “N.J. pension fund’s investment draws pay-to-play inquiry” is the way the Philadelphia Inquirer’s website, philly.com, headlined its story. “Christie administration to investigate pension investment tied to Massachusetts Republican” topped the story in the Newark Star Ledger. The Asbury Park Press and the Bergen Record covered the meeting with stories detailing the controversy. The Inquirer website salted the wounds with a huge photo of Christie on a stage with Baker, then the 2010 GOP gubernatorial nominee, when the New Jersey governor came to Massachusetts to campaign for him. It also carried a head-shot of Baker farther on in the story, with the phrase “pay-to-play” in the caption. The controversy is also drawing national media. Businessweek ran a piece about the council’s decision, Fortune magazine has weighed in, and CNN’s website has also followed the story. According to David Sirota, writing in the International Business Times last week, Chris Christie is now actively suppressing information related to the inquiry into Baker’s involvement in the situation in New Jersey. As chairman of the Republican Governors Association, New Jersey Gov. Chris Christie has helped Charlie Baker with millions of dollars worth of ads supporting his Massachusetts gubernatorial campaign. But that’s not the only way he may be boosting the GOP candidate in the final weeks of a close election: Christie officials are blocking the release of the findings of New Jersey’s pay-to-play investigation into Baker. The documents being withheld pertain to an investigation of Baker’s $10,000 contribution to the New Jersey Republican State Committee. The contributions came just months before Christie officials gave Baker’s company, General Catalyst, a contract to manage New Jersey pension money. New Jersey’s pay-to-play rules prohibit contributions to state parties from “any investment management professional associated” with a firm managing state pension money. In a reply to International Business Times’ request for the findings of the audit under New Jersey’s Open Public Records Act, Christie’s Treasury Department said the request is being denied on the grounds that the documents in question are “consultative and deliberative material.” Despite officials’ assurances in May that the probe would take only weeks, the New Jersey Treasury said in September that the investigation is still “ongoing” — a designation the department says lets it stop the records from being released. As a reminder: If the governor of Massachusetts has to resign for some reason — which, between scandals and promotions to Federal offices, is pretty common for U.S. governors in general these days — the lieutenant governor becomes Acting Governor of Massachusetts. From New York to Arizona, in the last six years, we’ve seen some pretty terrible lieutenant governors fail to rise to the challenge when suddenly promoted. If Charlie Baker becomes governor, and his term ends unexpectedly early for any reason, his current running mate, anti-gay Karyn Polito, would be the acting governor of Massachusetts. She wasn’t my first choice for Governor of Massachusetts, but here are 5 big reasons to make sure Martha Coakley wins in November, instead of Republican Charlie Baker. Veto Wielder: No matter who you supported in the Democratic primary, nothing genuinely progressive you wanted to see happen is going to get done to advance Massachusetts if Charlie Baker becomes governor and wields the veto pen. No matter how liberal he claims to be, he still identifies as a Republican, rather than a conservative Democrat, and that tells you where his priorities will lie. It definitely won’t be in pushing progressive laws and expanded investments in our state’s future, and it will likely mean vetoing them on so-called “fiscally conservative” grounds or for the benefit of Big Business. Even with strong Democratic majorities in the legislature, there is enough of a conservative wing in the Massachusetts Democratic Party to sustain Baker vetoes or derail and water down legislation toward elusive “compromises.” We saw what happened when we let Mitt Romney hold the veto pen: health insurance reform cost-controls were ripped out and the state’s health costs ballooned. We wouldn’t even be looking seriously at a “healthcare executive” to run the state if it weren’t for the last Republican’s horrible job of trying to make health care policy in the first place. We need a Democratic Governor to prevent that from happening all over again. Time and again, Democratic governors across the country have proven more fiscally responsible than their “fiscal conservative” counterparts in the Republican Party. In contrast, Martha Coakley has been running on a progressive platform this year with a long list of ambitious agenda items. She’ll work with the legislature — not against them — to make some of those ideas happen. Lieutenant Governorship and the Republican Platform: You might think the lieutenant governor (elected on a ticket with the governor in the general election) is unimportant, but if the governor has to resign for some reason — which, between scandals and promotions to Federal offices, is pretty common for U.S. governors in general these days — the lieutenant governor becomes Acting Governor of Massachusetts. We had two Republican Lieutenant Governors become Acting Governors in Massachusetts from 1997-2001. One even had to deal with 9/11’s impact on the state, after two flights from Boston were hijacked and ended in disaster. Fortunately, she was reasonably up to the job, but this is not something to leave to chance. From New York to Arizona, in the last six years, we’ve seen some pretty terrible lieutenant governors fail to rise to the challenge when suddenly promoted. So who did Baker select for that job? Supposedly inconsistent with his own views, Charlie Baker chose an anti-marriage equality “stalwart” (as the Boston Globe put it) as his running mate, to please the fringe base of the rapidly dwindling Massachusetts Republican Party. Last time around, Baker actually had the guts to run with an openly gay state senator, who this year was forced to boycott the state convention because it was set to adopt an anti-gay, anti-choice platform in the year 2014 in Massachusetts. Baker isn’t even in office yet and he’s already catering to the lunatic right-wing, while trying to convince us he’s more liberal than ever. If Charlie Baker becomes governor, and his term ends unexpectedly early for any reason, anti-gay Karyn Polito would be the acting governor of Massachusetts. That’s unacceptable. 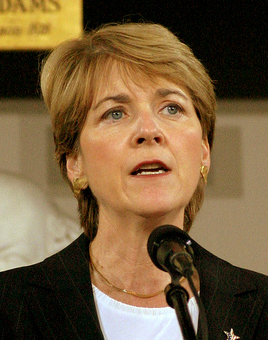 If Martha Coakley becomes governor, in the number two spot we’ll get Steve Kerrigan, a competent and progressive former Ted Kennedy staffer. The contrast in backup governors could not be clearer. Nominations: This is pretty straightforward. I would rather have any Democratic governor nominating people to the state’s courts and cabinet positions than Charlie Baker nominating them. His first nomination so far — his running mate, see #2 — has already given us a strong hint that he would use nominations as a way to appease conservatives who think he’s too moderate. Appointed officials and judges tend to be the people residents end up most affected by, whether they realize it or not. They are the people who make the big decisions on how to implement what the lawmakers approve or how to interpret those laws. If you don’t want your rights and programs in the hands of unqualified, right-wing Republican Party favorites, Martha Coakley needs to become governor instead of Charlie Baker. Executive Orders: When faced with an opposing party’s control of the legislature, executives start getting creative with executive orders. Sometimes that’s a good thing, but sometimes it’s a way of circumventing the normal legislative process and making or suspending rules and regulations by fiat. Again, there’s a legitimate role for executive orders, but I would trust Coakley over Baker on executive orders. Plus, she won’t need to rely on them as heavily, because she can go to the legislature controlled by her own party. – Implementation of Federal laws: From the Affordable Care Act’s Medicaid expansions to any number of other Federal laws that allow flexibility to state governments, we’ve seen in the past several years what the consequences can be of allowing Republicans to become governor. Don’t let Charlie Baker on Beacon Hill help Capitol Hill Republicans block President Obama’s agenda even more. – Baker for President? Charlie Baker, much like the last Republican governor of Massachusetts, Mitt Romney, has already flipped-flopped a lot to try to reposition himself for a second attempt to win office. If Baker becomes Governor of Massachusetts, it will immediately position him on the shortlist for the Republican nomination for president in 2020 or 2024. The media and the party opinion-makers love it when somebody doesn’t quite fit the partisan mold and manages to become governor of a state that is traditionally associated with the other party. These narratives are always overblown and oversimplified, but they sure fuel a lot of presidential campaign bids. Let’s not help Republicans find an electable, flip-floppy moderate to run for the White House. That’s a lot to take in. All of New England, most of the Mountain West and the Plains States, and so on. 36 states are on the board, and Republicans won a lot of them in the 2010 wave, which puts them in a good position overall, given the power of incumbency. But how do we analyze the state of the races more logically and clearly? In the chart below, I’ve broken it down in an easy-to-read list form, with the states listed in either the Democratic or Republican column, based on current occupant (there are currently no independents in the state governorships). There are boxes around the retiring or term-limited current governors. 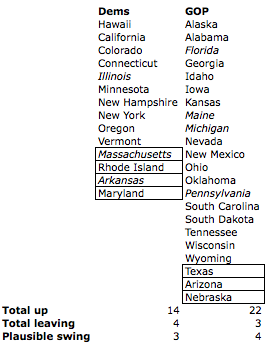 In that graphic, I’ve also put in italics the states that are most likely to be within reach. It’s not exhaustive, of course, just the likeliest. 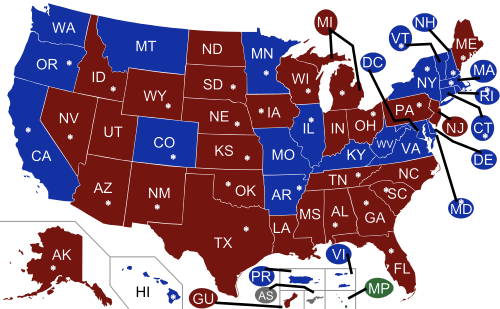 I based that determination — since I confess to being unable to keep up with all 36 races closely — on a) incumbent favorability from a year ago in the last Fivethirtyeight analysis I could find on the governors, and b) whether the voters have a solid preference for one party or the other in the governorship of their state. It’s a bit subjective and un-statistical, but it’s a good way to break down the problem when there are 36 races to analyze and too much data to crunch without being Fivethirtyeight or the like. Using that assessment system, I concluded that there is a relatively narrow set of races that are fairly likely to be competitive come November. Democrats’ biggest vulnerabilities — in my eyes — are Illinois, Massachusetts, and Arkansas. Let’s take those one at a time. Illinois: Gov. Pat Quinn (D) was an accidental governor elevated during the Blagojevich scandal. He won a very hard-fought race in 2010 to hold onto the office for his own full term. Now he is even more unpopular than he was in 2010, when he survived the Republican wave, and I don’t think the race is going well. That said, there’s very little recent data, and he’s come back from the brink once before. Massachusetts: Democrat Deval Patrick hung on in a 3-way race in 2010 but is retiring. Runner-up Charlie Baker (R) has generally been campaigning strongly in his repeat effort, while Democrats have fragmented between terrible, uninspiring, and unheard-of candidates. On top of this, Massachusetts has had a string of moderate Republicans between Dukakis and Patrick, with voters often seeming to prefer the office to counterbalance the single-party rule of the Democratic legislature. Dems may still hang on — indeed, leading contender Martha Coakley is currently polling well ahead of Charlie Baker (which means very little given her past track record and sketchy Bay State polling histories) — but the seat is very vulnerable. Arkansas: The state has Republican supermajorities in the legislature, has a term-limited Democratic Governor, Mike Beebe, who recently often seemed like the last Democratic oak standing in a Southern desert. The other windswept tree in the state, Sen. Mark Pryor, is in the political fight of his life right now. (I don’t have a good sense of how the Senate race will affect the governor’s race, if at all.) Dems seem to have a recruited a solid candidate to try to save the governorship, but it will be difficult. The RCP average has a close race, but the PPP poll within that average shows an 8 point advantage for the Republican. Florida: Rick Scott (R) is a terrible and very unpopular governor. Republican-turned-Democratic former Gov. Charlie Crist, his opponent, is far more popular and is polling relatively far ahead. Maybe Scott turns this around, but probably not. Maine: Paul LePage (R) is also a terrible and very unpopular governor, who is also (ideologically) a crazy person. He was only elected in a 3-way race in 2010, where the sane people made the mistake of splitting their votes between the other two candidates. Maine isn’t planning to repeat that mistake this year. Haha, just kidding: It’ll be a 3-way race again and probably a nail-biter to the end, between LePage and Congressman Mike Michaud (D). LePage is doing better (somehow) in polls more recently than he was for most of last year. Michigan: I am of the opinion that Gov. Rick Snyder (R) has been a horrendous governor for Michigan. He was, last year, almost as unpopular as LePage was in Maine. Democrats have coalesced behind a solid recruit, a U.S. Congressman, Mark Schauer. Nevertheless, Snyder seems to be a good campaigner with a lot of powerful friends (i.e. interest groups) and a ruthless agenda that the tea partiers love. He’s doing well in the polling, unfortunately. Pennsylvania: 2010 was a great year for Pennsylvania Republicans. However, Gov. Tom Corbett has been such a bad governor (and was dragged down further by the Penn State scandal) that he will probably be the first governor since the state allowed multiple terms in 1970 to lose re-election to a second term. These “unbroken precedents” in U.S. politics — most of which date back only as far as the 1970s — always tend get broken right after they’re declared ironclad. While researching this post, I saw some posts arguing that he will actually win. (Good fundraiser, incumbency precedent, his past big victories, past popularity before it tanked, etc.) But he’s trailing by high single digits in most polls at minimum and by double digits against several candidates in a lot of polls. So there are about seven seats to watch right now. It might expand to 10 or drop to 5 as we get closer to November. My guess is that Republicans will lose a few of these seats — which isn’t surprising given how many they are defending — but will retain an overall edge and even pick up at least a couple. That basically means it’s probably going to be roughly a wash overall, without changing much nationally. I think that may be echoed in many of the other contests this year: Republicans will end up in about the same position they were when they started, but still ahead by a bit.